SquadLocker’s innovative TeamLocker™ platform is seeing a surge in interest from coaches, league managers, youth league management software company executives, major brands such as Under Armour and Nike, as well as local mom and pop sports retailers. Why? Utilizing the innovations of SquadLocker’s newest technology developments, namely the TeamLocker™ workflow, league management software companies can form revenue sharing partnerships that deliver an integrated, easy-to-use online experience, instant value for teams, leagues, and schools, as well as an incremental revenue stream. And the best part is that the integration is very lite. It is enabled via a Web app that can be launched within the league software workflow so that the user experience is seamless for the league software customer. And, for mom-and-pop retailers, the SquadLocker platform eliminates archaic analog workflows while ensuring that all orders are expedited meeting their high standards, and eliminating the guess work. What makes SquadLocker different from everyone else? Several key differentiators are separating SquadLocker from other technology-based providers entering this marketspace. What makes SquadLocker different from everyone else? SquadLocker’s business is the perfect combination of old economy supply chain and decorating infrastructure that has come together with process controls to execute mass personalization at scale, built into a scalable business environment leveraging seamless customer onboarding. Orders are acquired and delivered directly to the manufacturing floor without human touches along the way. Additionally, there’s a full-time customer support dedicated to making sure each and every order exceeds client expectations. The customer promise is fulfilled when the SquadLocker box arrives and the proud team member or fan receives their decorated team apparel. In between, there’s a collection of people, processes and technology that brings the product to fruition, including a dedicated work force at a 40,000-sq. 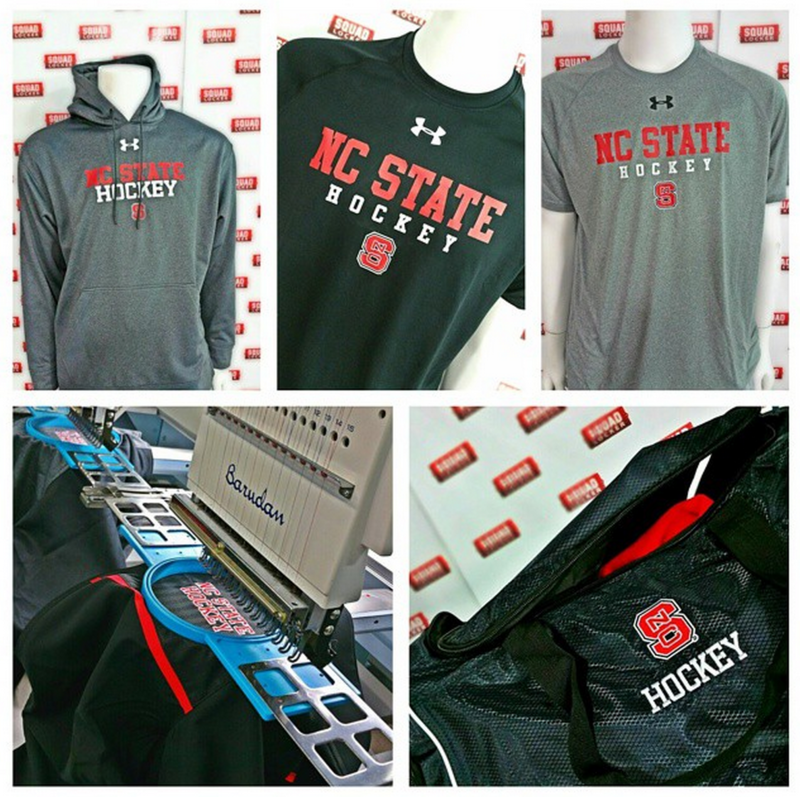 ft. state-of-the-art US-based manufacturing facility, representing the world’s best athletic apparel brands, and the industry leading AccuracyGuard product warranty. This states that if it’s not right we’ll make it right no questions asked. That’s our promise!! After all, every order is one step closer to Team Gear utopia… improving how team gear, athletic apparel and uniforms are bought in the future, making it easier for coaches and volunteer league organizers so they can spend more time inspiring and mentoring young athletes. Every parcel of decorated apparel we ship is our first opportunity to make a great first impression. Is the selection and buying process made simple using web apps and easy to use tools? Does the gear arrive on time and as the coaches ordered? Is there a proprietary Gear Matching system that ensures selection of the right gear for the team based on sport, age level and gender? Will you have access to authentic athletic apparel brands for athletes of all sports? Are there style recommendations of the best sellers and most commonly selected gear items? Does the platform make it possible to use templated store and filtering tools? Is it possible to instantaneously auto-build flash stores launched in less than 5 minutes? How easy is color matching of team colors to similarly colored garments from the various brands? Do editing tools enable quick team logo uploading? Who’s ordered what, who hasn’t? Are there promotional tools for promoting and communicating with parents? Are 48 hour alerts e-mailed to parents? Is there a self-service selection of items to be offered to players? How about an easy-to-use fundraising function? Does the vendor have an AccuracyGuard-like guarantee backed by American craftsmen at a best-in-class manufacturing facility that ensures that each and every order meets and exceeds expectations? Does the vendor offer a Customer Bill of Rights and a 100% product warranty? Sound possible? Intrigued? Visit SquadLocker.com and while you are there, check out SquadLocker’s Customer Bill of Rights.